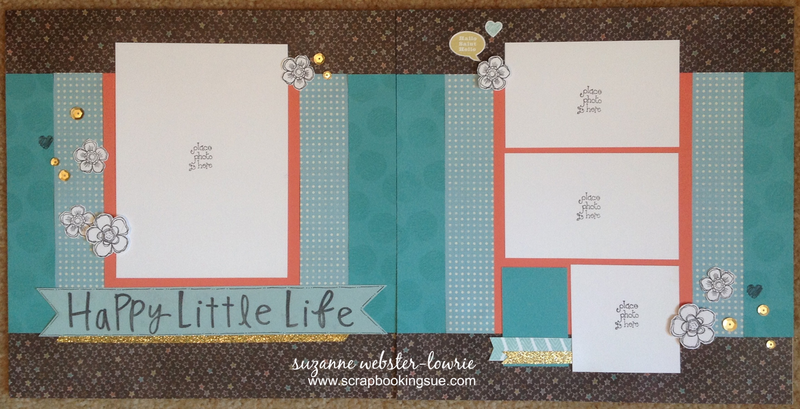 The “Happy Little Life” scrapbook layout was another project that we completed during the Close To My Heart annual convention this past June. Armed with a ton of new papers, colors, and stamp sets, we created this eclectic layout using a variety of different products. That’s one of the great things about using a variety of products from CTMH on the same project, everything matches! Here is Page 1 of the scrapbook layout, and a closer look at some of the details. The main base pages for this layout were some of the patterned papers from the Chalk it Up Paper Packet. The blue, dot patterned paper was from the Wanderful Paper Packet. Cardstock colors included: Lagoon, Sorbet, and White Daisy. I stamped the “Happy Little Life” sentiment with varying upper and lower case letters from the “Handwritten Print” stamp set. This is a HUGE stamp set with 67 letters, numbers, and punctuation stamps! The background circle stamps were from the “Glitter Glam” stamps set. They were stamped with Lagoon ink onto Lagoon cardstock for a tone-on-tone effect. Here is Page 2 of the scrapbook layout. The flowers were from the “Happy Birds” stamp set. Since they have a lot of white space, you could always color them in with markers, colored pencils, or watercolor pencils. The arrow along the bottom and the “Hallo Salut Hello” sentiment were from the “Here We Go” Stamp set, and the tiny heart stamp was from the “Glitter Glam” stamp set. Wow, that was a lot of different papers and stamps! See how you can mix and match from different sets with great results?! To finish off this scrapbook layout, Gold Shimmer Trim and Gold Sequins were added throughout the layout.